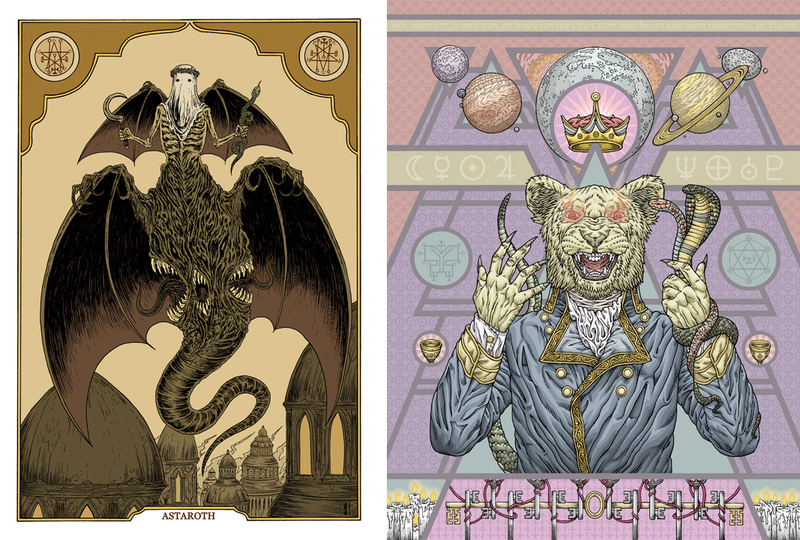 Gunsho’s Goetia is the psychedelic brainchild of James Quigley and is based on King Solomon’s writings of demons. The Goetia itself is the second part of the ancient text The Lesser Key Of Solomon and contains invocations and descriptions for 72 demons. Solomon was purported to have summoned these demons, trapped them in a bronze vessel (sealed with magic symbols) and used them to do his bidding. Gunsho’s Goetia Vol. 1 contains 24 painstakingly detailed illustrations and excerpts from the magical tome itself. BEWARE! on Canson brand neon green paper. One full color poster print by Zé Burnay based on the demon Astaroth. One full color poster print by Michael Bukowski based on the demon Orias. *Note: Samuel Liddel & MacGregor Mathers are actually one person. However, Samuel Liddel MacGregor Mathers was often mistakenly credited as two individuals, so we decided to keep the tradition going.